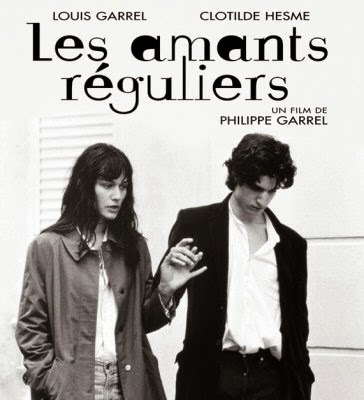 The grainy black-and-white imagery and raw sound give Regular Lovers an impression of verité instantly belied by Philippe Garrel’s aesthetically minded composition. Often, the film resembles a documentation of experimental theater more than a recreation of the director’s memories of May ‘68, particularly in its first half. The frontloaded scenes of violent student protests are presented as flattened, static looks at both students and cops, each group set against a pitch-black void as they shuffle nervously from side to side rather than in deep recess toward the opposition. Canned explosions and minimalist barricades only complete the oneiric vision of protest, so much so that a dream sequence of the students rendered as 18th century Jacobins almost passes by unnoticed for looking no less real than the riots in the present. This alienated, dispassionate rendering of May ‘68 protests, the opposite of more vividly captured replications in films like Something in the Air, avoids nostalgia or belated self-justification on behalf of the author in favor of his mature reflection on the events of his youth. Regular Lovers stretches out for three hours to cover a well-worn subject in French cinema of the last 46 years, and by getting protests scenes out of the way quickly, it does not bother to tease the audience with thrills from a foregone conclusion. Other films on this subject attempt to capture the fury and defiance of youth in revolt, but this one cannot muster any excitement for so bitter a loss. Very pleased to say that I am covering this season of Game of Thrones for Slant's House Next Door blog. Here are links to the first five recaps, and this post will be updated with links to future coverage. Episode 2: "The Lion and the Rose"
Episode 3: "Breaker of Chains"
Episode 5: "First of His Name"
Episode 6: "The Laws of God and Men"
Episode 8: "The Mountain and the Viper"
Episode 9: "The Watchers on the Wall"
Here are the rest of my outstanding review links, all of them Blu-Ray reviews for Slant. Louie, Season 4, E01 "Back" and E02 "Model"
I'm covering Louie's new season for Slant's House Next Door, and here is my recap for the premiere double-header, which shows the series operating at its usual creative and aesthetic heights but also, in the second episode, an illustration of its worst traits. Overall, it's great to have the show back, but I hope the material with Yvonne Strahovski is an aberration. Read my recap at Slant. Fritz Lang stood out as the first master of sound cinema by making talkies that, ironically, seemed quieter than his silent epics. Films like Die Nibelungen and Metropolis are gargantuan affairs with so many moving parts that you can practically hear gears turning, set to bombastic scores of Teutonic music. 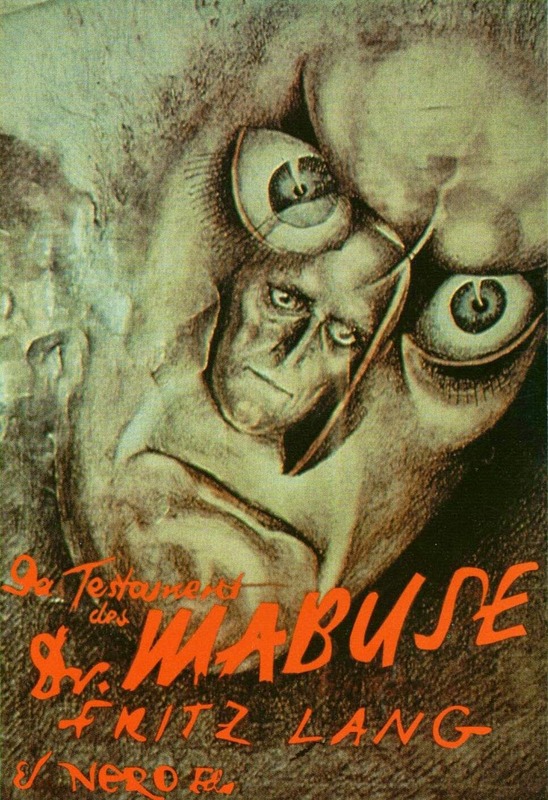 Starting with M, however, the music dies, invoked only through troubling diegetic means like the killer’s whistle in that film, or the deranged humming in The Testament of Dr. Mabuse. Even in Lang’s Hollywood films, where a score is imposed, there are moments of eerie silence, none more gripping than in the opening of 1941’s Man Hunt. In the place of bombastic music, that felt sound of machinery from the silent films can now be literally heard; the first scene of Testament, for example, takes place in a printing press, the roar of printers rocking the room and sounding like a train about to burst through the walls. Ninja II came out on home video at the very end of last year, and it was one of the best action films I saw in 2013. From what I've seen of his direct-to-video work, Florentine doesn't seem to be growing as a filmmaker, but he does continue to consolidate his strengths, chiefly a deft command of filming close-quarters combat. Not a classic, but more pleasingly unpretentious and to the point than most big genre films will allow themselves to be anymore. Check out my review at Movie Mezzanine. Over the last year or so I've become a devout fan of Abel Ferrara, the gutter-punk poet of New York, whose works of self-investigating exploitation take Martin Scorsese's subjective indulgences to new heights of autocritique. Ferrara is primarily known, if at all, for Bad Lieutenant, but hopefully his coming one-two punch of biopics on Dominique Strauss-Kahn and Pier Paolo Pasolini will boost his profile. But that leaves a career filled with fascinating entries to explore, which I can only do briefly in this piece. One day I'd like to write at length about each one, and damn near each one would be worth the effort. Check out my piece at Spectrum Culture. I like to give every film its own page here, even when linking off-site, but frankly I've fallen too far behind on updating this blog with my clips, so here's the first of a few round-ups to get caught up.